Rev. Frank Pavone, experienced pro-life activist and leader of one of the nation's largest and most influential pro-life organizations, reveals a plan for making life the law of the land. 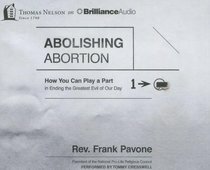 About "Abolishing Abortion (Unabridged 8 Cds)"
Rev. Frank Pavone serves as the president of the National Pro-life Religious Council and as the national pastoral director of Rachel's Vineyard, the world's largest ministry of healing after abortion. He is the national director of Priests for Life, the largest Catholic pro-life organization in the world.nbsp;Pavone has received the "Proudly Pro-life Award" by the National Right to Life Committee, and numerous other pro-life awards and honorary doctorates.